Thailand’s external trade balance posted a surplus of $1.1bn after two consecutive months of deficits. This was at odds with the consensus estimate of a $1bn deficit. A sharp slowdown in imports was responsible for the positive swing in the trade balance. Contrary to the consensus estimate of a slowdown in the year-on-year growth to 4.9% from 14.7% in November, imports crashed by 8.2%. Falling crude oil prices may explain some of the import weakness, though we believe it's more than that. Electronics and automobile, the front-line sectors to face the brunt of the US-China trade war, are already coming under pressure. Thailand forms a key part of the supply chains for these sectors and the weakening of raw material imports processed for export as electronics and auto parts appears to have gained momentum. Exports continued to be weak with the 1.7% YoY contraction beating the consensus estimate of a 0.2% fall. 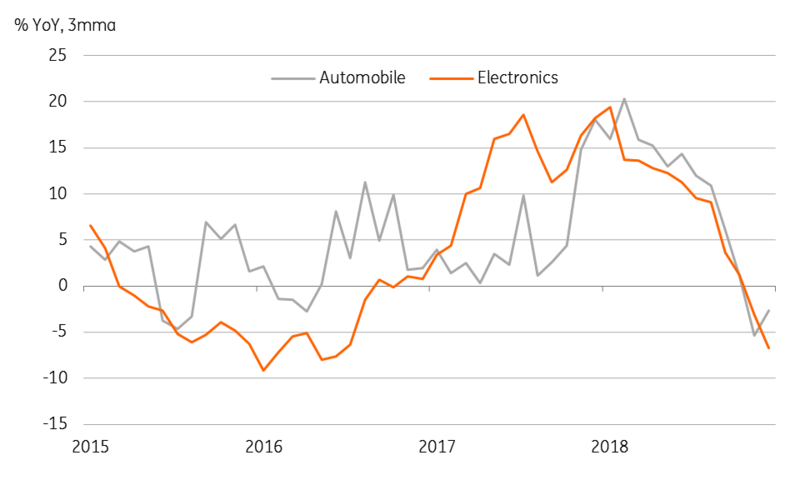 Electronics were down 13.5% YoY, the steepest fall in three months, while autos recovered to 2.8% growth from a falling streak since September. The annual export growth of 6.5% in 2018 was a slowdown from 10% growth in 2017. Likewise, import growth eased modestly to 12.7% from 14% over the same period. This produced an annual trade surplus of ‘only’ $2.4bn, a significant drop from over $15bn in 2017. The trade balance drives the current account. 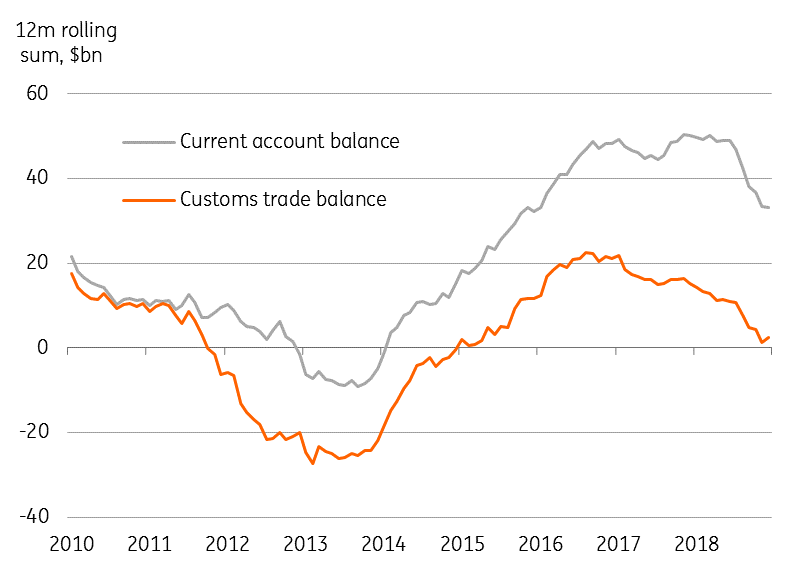 As most of the decline in the trade surplus passed over to the current account, the latter experienced a sharp reduction in surplus over the last year even as services income remained steady. The $29bn current surplus in the first 11 months of 2018 was $17bn lower than in the same period of 2017. We estimate the full-year 2018 current surplus of $33bn or equivalent to 7.7% of GDP. Despite a sharp narrowing from over 11% of GDP in 2016 and 2017, the current surplus is still relatively high among Asian peers, and this represents strong support for the currency. After a dismal second half of 2018 performance, the THB is back to being among Asia’s top performers thus far in 2019 with a 2.4% appreciation against the USD. If there is anything that could displace it from this position, it’s politics, as uncertainty about the election timing is growing. We maintain our view of the USD/THB weakening to 33 within the next 3-6 months.